I love to be fashionable, stylish, on trend and all that jazz, but being a super busy momma with a limited budget, limited time, and messy kids makes it very hard. I cannot logically spend $100 on a top, then find the perfect necklace, belt, shoes etc. Even if I could, I barely have time to change out of my pajamas. Being comfortable is a must for me, I cannot be trying to pull down a shirt or put my breasts back into my top. Pull down, pull up, adjust here and there, do the hokey pokey...too much hassle. And then my kids would end up spilling something or touching me with sticky hands and the outfit would be ruined. And trying to wash all those "fancy" fabrics and such, forget about it. That is why I love finding statement pieces that make me look fashionable without having to worry about all that stuff. Jeans, sneakers and a fabulous T-shirt and viola, my outfit is complete. That is where Dpcted Apparel comes in. 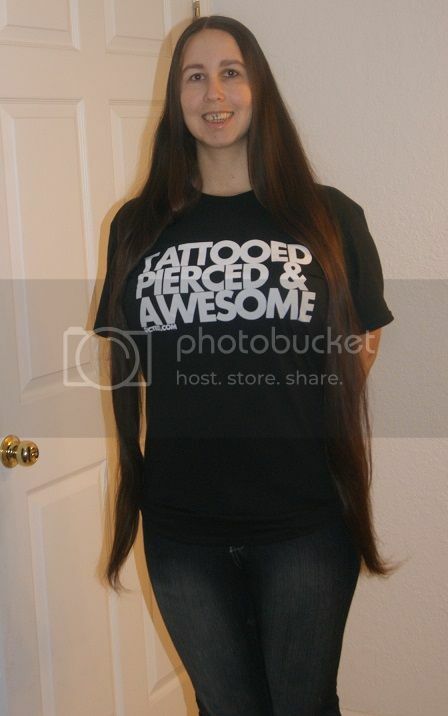 They make the most awesome shirts I've ever seen. I am all about clever, fun, sayings, and Dpcted definitely delivers. They have tons of color options and use big, bold, print, which I love. I just got 2 new shirts from Dpcted Apparel, and I totally adore them. I am trying to loose wight, but I am still a big girl. I have never been really small anyway. So I am chubby and I know it. It's not something I like, but I can embrace it, especially if it's in a fun way. 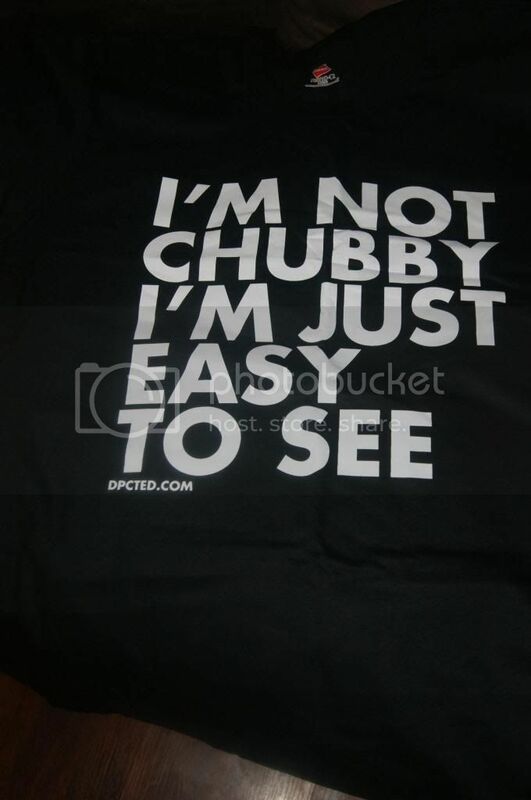 This shirt is perfect for representing how I feel about my chubbiness. I love the way the black and white go together, making this really stands out. I tend to always navigate towards black clothing anyway. I am borderline Goth for sure, and not just with style. I love how cool this shirt is, seriously, everyone loves it. I get actual laughs sometimes. People always ask me where I got this. I love that it will go with anything(casual). Any style jeans, shorts, even khakis. It is so simple. No fuss, no muss, just awesomeness. Which brings me to my next shirt. I have to represent my awesomeness, and this shirt is perfect. Once again, I went for the black. I just couldn't help myself. I am a tattoo freak. I only have 3 so far, but that is because I could not afford more. And besides my ears I only have one piercing, but it's(in my opinion) the best one to have, my tongue. I want my lip done too, but it is so not practical with little ones, it would be a great handle though, lol. This shirt is so perfect for me. I love it to pieces. I get compliments galore on this one as well, and my hubby really loves it. He wants one too since he also loves tattoos and has a tongue piercing. 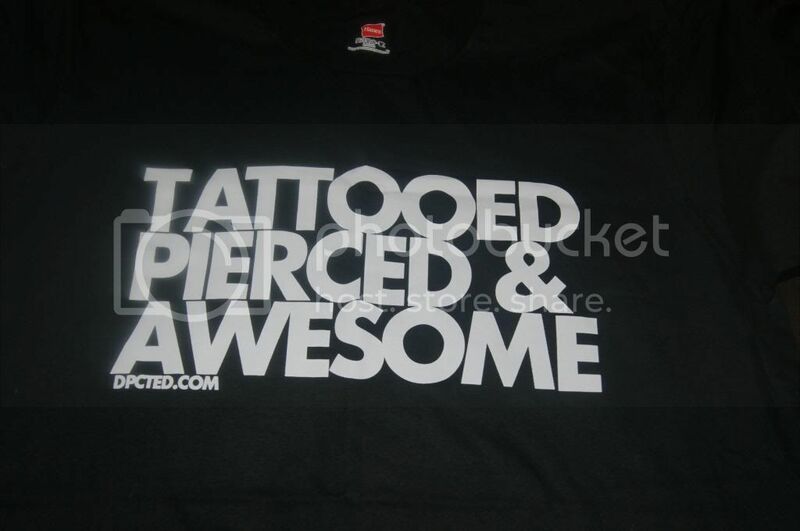 Dpcted has so many other variations of Chubby, Tattooed, Pierced, Awesome and also Bearded shirts, and they are all great. My husband and I would really love to see one that has to do with Branding though since we are both branded as well. I am thinking "Branded and Bad A$$". I love both my new shirts. They are so fun and the quality is amazing. The are super comfortable and they keep their shape so well so they don't look boxy or unflattering. They are thick enough to be durable and to look great, but not all heavy and hot. They are so easy to care for, and they look great even after putting them through the ringer(so to speak). I got my first Dpcted Apparel shirt over a year ago, and I wear it ALL THE TIME. You can tell it is well loved, but it still looks so good compared to my other shirts. The collar is a little stretched from my daughter pulling on it, but every time I wash it, it goes back to normal. This has gotten so many "stains" on it, but they always wash out, it's like a miracle because I never treat it special or anything. I know I will love my old faithful as well as my new Dpcted shirts for many years to come. I will wear them until the disintegrate. And I am nowhere near done with my collection. I am a Dpcted addict. If you want a fun, stylish, affordable, unique, high quality shirt, then you HAVE to check out Dpcted Apparel. Also, check out(and Like) Dpcted Apparel on Facebook to see new style ideas and pics of other customers in their awesome shirts. Great review and they have some great shirts. I will have to check it out. Wow I love there shirts! 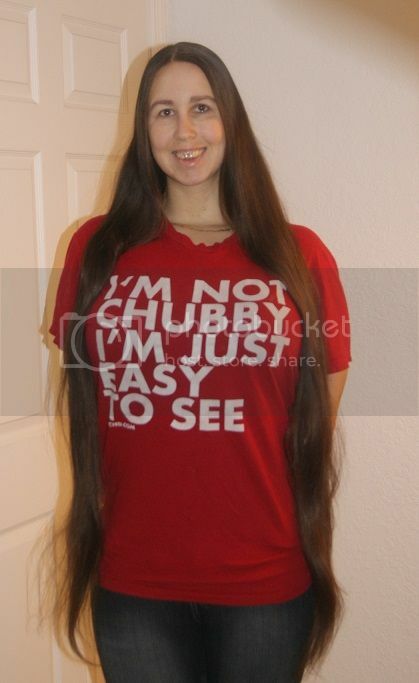 I am a chubbster so this would be great for me lol! I love the shirts! I will have to check them out! thats a funny shirt! i LOVE the red the best! Those are too funny and cute! Great review! So cute, I love the T-Shirts!